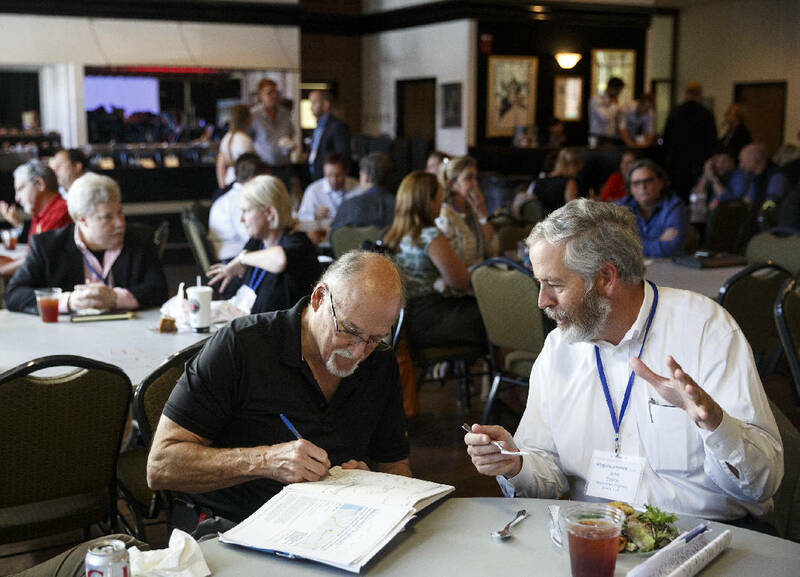 Author and engineer Bob Needham, left, talks to John Eyster with Watermark Property Group, LLC on the closing day of the AngelSummit investors' summit Wednesday, Oct. 14, 2015, in Chattanooga, Tenn. Techstars founder Andrew Hyde was the keynote speaker for the summit, which connects startup business leaders and entrepreneurs. * A conference put on by Washington DC-based Startup Angels aimed at framing the startup investing landscape in order to facilitate conversation among community and industry leaders, and ultimately prepare more investors to fuel greater innovation in their communities. * AngelSummit US offers attendees insights and tactics for building successful, scalable startup portfolios that are just as innovative as the companies they finance, according to Startup Angels. * The first summit was in Dallas last year, followed by one in Spain. The next, AngelSummit Americas, will be in 2016. The location has not yet been disclosed. Conversation about investing was the coin of the realm for AngelSummit US, the two-day conference in the midst of Startup Week Chattanooga. After all, getting a cash infusion can be critical to launching a company. The summit, held Tuesday and Wednesday, didn't center on the sizzling visions of budding companies. Instead, it was for investors, to help them learn more about putting money to good use in startups. It brought together accomplished entrepreneurs, business leaders and investors from across the country. Patrick Turns, managing director for Selego Capital, arrived from Nashville Tuesday night. His firm helps families find attractive investments. "It's an opportunity to network with other investors," Turns said. He'd made it to a keynote talk or two and planned to attend a session titled "How Investors Think" late Wednesday afternoon. Lisa Calhoun, a general partner from Valor Ventures, was up from Atlanta for the summit, too. She moderated a panel titled "Role of Angel Groups and Associations" Wednesday morning. Her venture capital fund is looking to raise $50 million in the next year and has already raised $5 million, she said. But there is another way to frame investment and it doesn't have to do with money, according to Andrew Hyde, who founded the original Startup Weekend and gave Wednesday's closing keynote speech. It has to do with community, and community created authentically and maintained with good intention, helps startup projects blossom, Hyde said. That means not being proprietary, even in how an entrepreneurial community evolves. It means sharing ideas and not being bitter if your buddy gets money from an investor you thought you'd get money from. "Everyone feels welcome, everyone feels valued, everyone can be complex," Hyde said. That sense of collaboration is what brought about success for the startup community that he's part of, in Boulder, Colo."
Also, a startup doesn't have to be something scalable, or tech-y or become something huge, Hyde offered. His definition of a startup: "A project of passion." That can mean launching a .t.aco stand. Hyde, who said he's given talks on entrepreneurship in 67 countries in the past five years, encouraged Chattanooga to maintain its own identity. "I've learned that Chattanooga does not have an annoying 'Silicon-blank' name. Keep it that way. Chattanooga should be plainly just Chattanooga," he said. Startup Angels brought AngelSummit to the Scenic City, following similar events during the past year in Dallas and Spain. The Washington D.C.-based company describes itself as a global platform for new angel investors to learn about startup investing and expert investors to learn about new markets. Launch Tennessee president and CEO Charlie Brock had spoken at the Dallas AngelSummit US event last November. He approached Startup Angels founder and CEO Leslie Jump about bringing the event to Tennessee. One event a year is focused on the United States, Jump said. "I just asked the question," Brock said. Launch Tennessee is a public-private partnership supporting the development of high-growth companies in Tennessee. As it turns out, mid-sized cities, like Chattanooga, are great for new companies to get going, Jump said. "They're sort of nimble, like startups," she said Wednesday. "We saw that in spades here." Contact Mitra Malek at mmalek@timesfreepress.com. Follow her on Twitter @MitraMalek.